Launch your card sort quickly and get the results that matter. Step through building a card sort. Card Sort settings are divided into 7 categories with all settings defaulted to get you started quickly. At any point you can preview what your participants will see when you provide them your test - but no data is saved to your project when you preview. Enter or import your cards and optional descriptions. Adjust settings for how cards are shown to the participants. Modify the messaging and style your card sort with your company logo and color scheme. 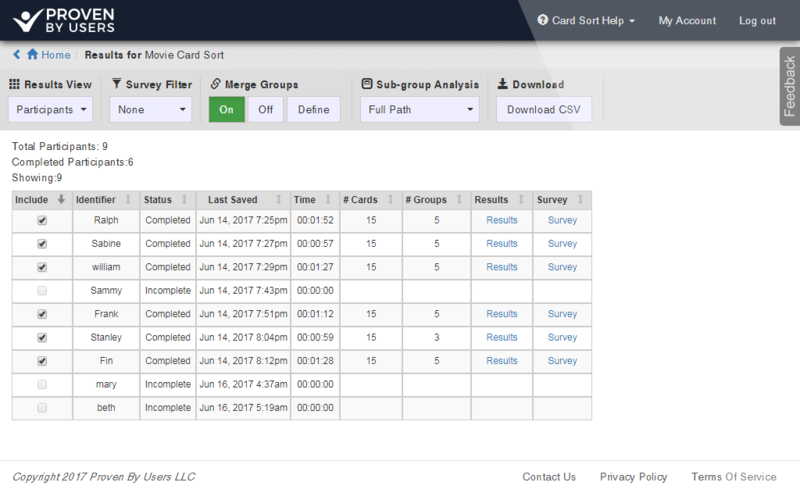 Add survey questions before and after your card sort to help you filter your results during analysis. When you are ready to launch your test and begin collecting results make your project Live and send the project URL to your participants. Send your participants a unique URL and have them complete your card sort. No software installation required. Get to know the Sorting Interface. The Card Sort begins with a customizable welcome message, and the collection of an participant 'identifier' that you will see in your results. Like most settings, this can be turned off. Your company's logo and color scheme appear in the header. 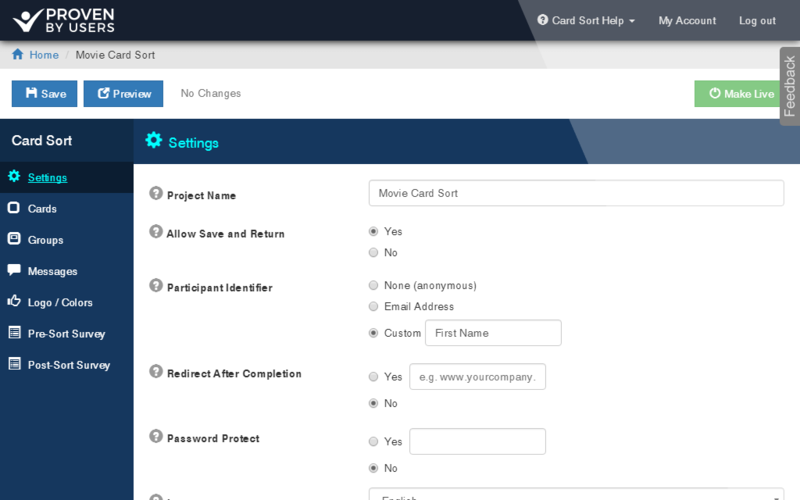 Next, the participant can be taken to a pre-sort survey, built in Proven By Users. This is typically a good place to collect demographic data about the person that you would use to filter sort results. The survey of course is optional as well. Upon starting the Card Sort, the participant will see customizable instructions. These instructions are available during the card sort via a link in the top right. On the sorting screen, the cards you entered appear on the left. Cards with additional information have an icon that reveals the information on click. Participants drag the cards into an existing group or into the work-area of the screen to create a new group. If enabled in your settings, participants can provide comments on groups. If you have enabled sub-groups in your settings, the participant can drag groups inside of groups. When the participant is done sorting their cards, they use the I'm Done button to submit their results. In some situations participants may need to stop and finish later. If you enable this setting, participants can use the Save For Later button and will be provided a URL to return to in order to complete and submit their Card Sort. Collect additional information from your participants using a post-sort survey. 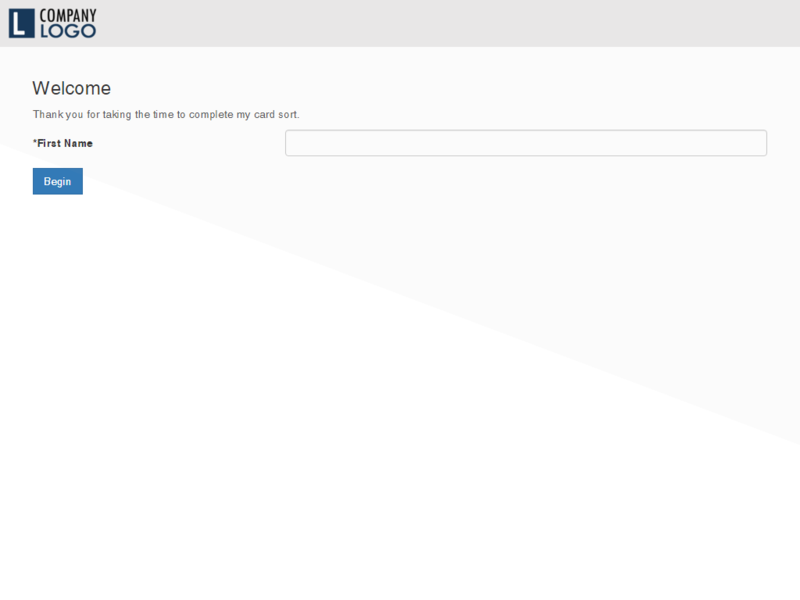 Lastly, the participant is taken to a customizable Thank You message, and/or redirected to a different website. The participants data is saved and ready for analysis. Designed for discovery and control. See the Results Analysis Interface. The top bar provides controls for your analysis. The Results View changes the data and context of your results to provide the most insight. If your card sort included a survey, you can build Survey Filters to target the results of a specific group of participants. Merge Groups (a.k.a standardization) allows similar group names (in open & hybrid sorts ) to be combined during analysis. Sub-group Analysis is available when your settings allow participants to place groups inside of groups. Various options allow you to view the Results View showing all or parts of the sub-group hierarchy. Download captures the view on your screen into a CSV file. Proven by Users provides 9 different results views of your results data. Some target specific questions you have, while others help direct you to outliers or solutions. Let's look at a few. The Participants View is a summary view of all the people who participated in your Card Sort. It also provides you access to a view of each participant's card sort results and survey results. From this View you can also exclude participants from all other Results Views. The Similarity Matrix page displays the percentage that any one card was grouped with another card. Placing your cursor over any cell will highlight the two cards that the cell represents. The Tree View displays the results of performing a cluster analysis on the similarity matrix and displays the result in a tree format. The Tree View shows card clustering from strong to weak - left to right. The Maximum Agreement View displays the most common card placement within groups. Cards placed with equal agreement across groups are shown multiple times and highlighted. Finally, Review the results of your Pre and Post-Sort surveys in the survey view. Register now and have your card sort setup in no time. No payment information is required and you will be defaulted onto our Free plan. Want to see a card sort in action? Try one of our sample card sorts! Don't want to register but still want to test us out? Take our demo for a spin and build a sample card sort now!